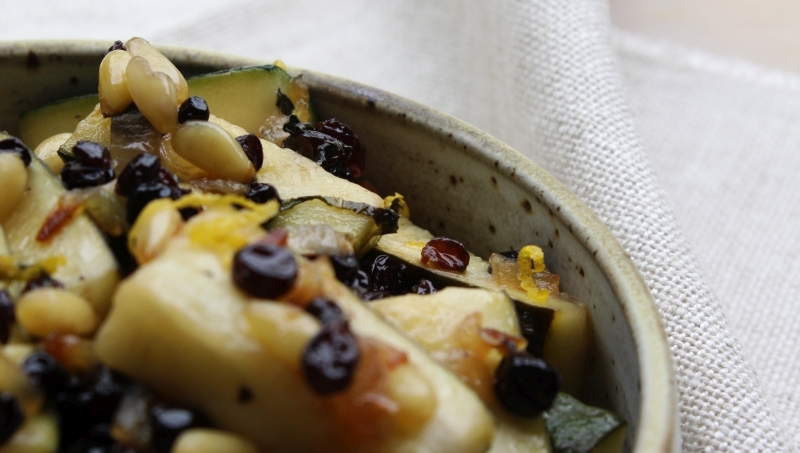 When I was growing up zucchini was the most uninspiring green vegetable served at our table. My mother, bless her, would boil it until it was very soft and then serve it with a little butter and salt and pepper – squishy, flaccid, and bland. It was the way most people cooked green vegetables in the 1970s. It wasn’t until much later that I realized that zucchini had flavour, and that it was delicious! I’ve been growing zucchini in the garden this summer and we have had a surfeit of this sweet and tender vegetable. I remembered reading a recipe in a very old Gourmet Traveller magazine for zucchini with currants and it was from that idea this recipe was born. Much of the everyday food I cook for my family is simply grilled meat with vegetables, so any recipe that makes vegetables more appealing is on my watch list. 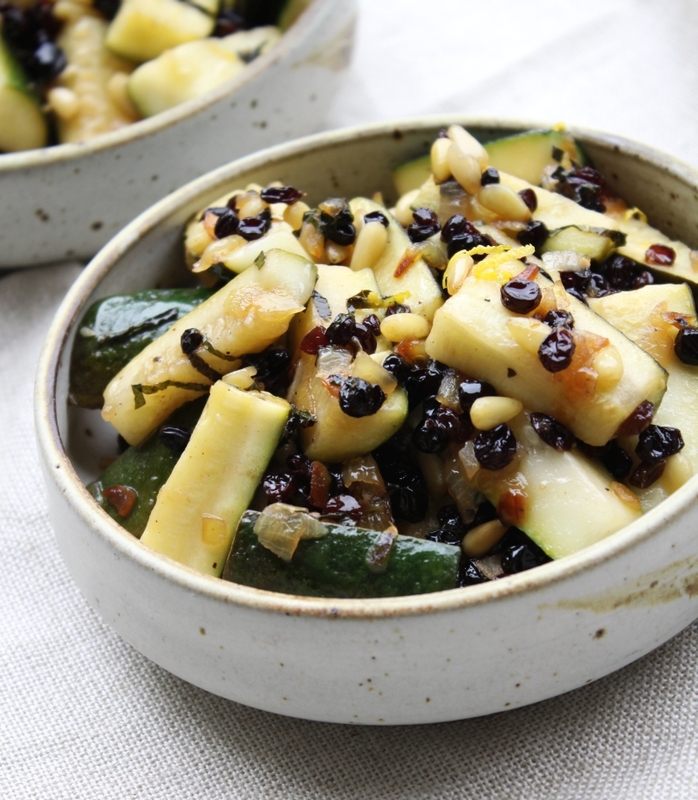 I think this fits the bill – the sweet, spicy currants and slightly astringent dressing make the zucchini something special, and it works well served hot or warm. You could even cut the zucchini a bit smaller and toss through pasta with a little fresh ricotta cheese. In a medium sized fry pan over low heat, cook the onion, garlic and currants with the olive oil, for about 5 minutes, until the onion is soft. Turn the heat up and add the zucchini. Cook for another 5 minutes, tossing the zucchini around to cook it evenly. Add the vinegar, sugar, pine nuts and mint and cook for another 2 – 3 minutes. Season well with sea salt and black pepper. Turn onto a serving plate and scatter over the lemon zest. Serve hot or warm. That ‘anonymous’ post re the zucchini was Elise. 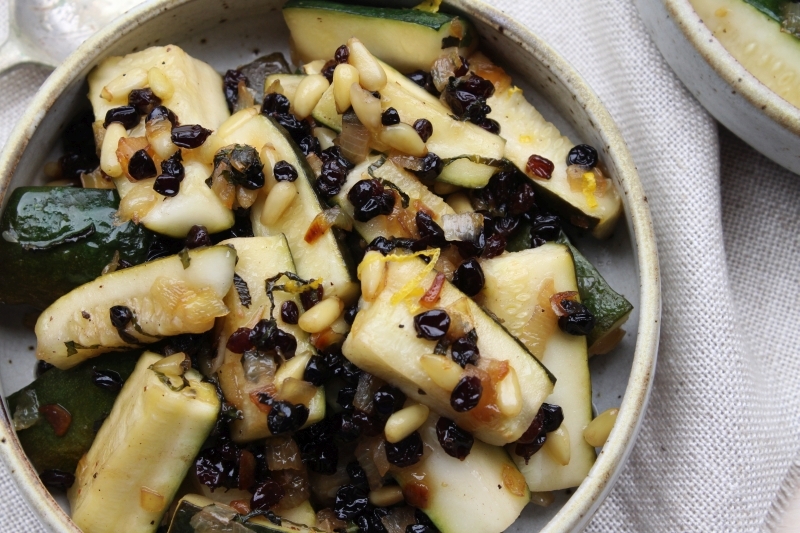 I never would think to add currants and pine nuts to zucchini. Definitely one of my favorite veggies though!